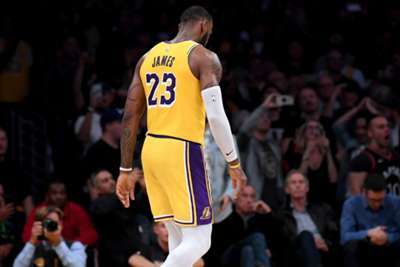 LeBron James said he knows what he got himself into by joining the Los Angeles Lakers and took responsibility for their third straight defeat despite his late heroics against the San Antonio Spurs. Superstar forward James nailed a stunning three-pointer from the top of the arc with just two seconds remaining of regulation time in Monday's contest. But James then missed two free-throws in overtime, paving the way for the Spurs to clinch a 143-142 victory and consigning the Lakers to an 0-3 start to the NBA season. It may have been another disappointing result for the Lakers, but James says he understands that the team are a work in progress. "I know what I got myself into, it's a process, I get it, we'll be fine," he told reporters. "I didn't come here thinking we'd be blazing stones out the gate, it's a process, I understand that. We're just frustrated not to get the win." Asked if it was the kind of game the Lakers will start winning later in the season, James said: "We can't just say that, we don't know that. "But we can gain experience and see how it helps us later in the season." James' missed free-throws came with the Lakers leading by one point and he described his efforts from the line as "unacceptable". However, James feels that teams are being too harshly penalised in defense. "We're still doing a lot of fouling, it's hard with the new rule changes, you literally can't touch anybody, well you can somebody, defensively we don't know, we're trying to figure it out," he said. "But every time we're in defense, especially third quarter, we kept putting them into the free-throw line. "We have to figure that out. It's giving teams too many easy opportunities to knock down free-throws."